The world we live in! : Why do i learn music? For what purpose? Someone asked me the other day, "For what purpose do you learn, i mean why do you learn, simply-learning or...." I am like, "or what?..." She is like, okay, so you learn simply. Waha.. I learn simply???.. (funniest statement ever heard) Cause i never thought of my music like that. And i didn't quite get the "simply-learning" though. But it left me thinking, really why do i learn, is it a valid question to ask!! Well, i learn because i have passion for singing is what i told this lady. I don't know if she got it but she frantically noded her head. (you know like when someone really gets you OR actually disagrees but wants to conceal the disapproval) So i got a HUGE nod. She got it. Later that night, when i was doing my before bed Riyaaz, that is practice, i was constantly thinking, really why do i learn. 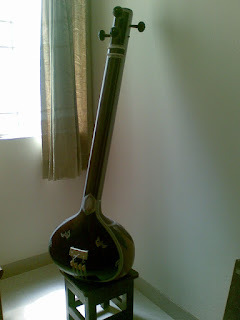 Then just like magic, i began to float in my Raag and got transported to some other world and purely enjoyed what i was singing. 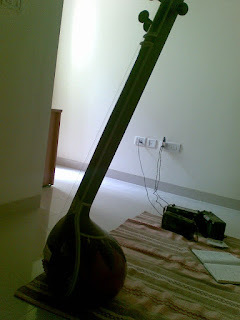 I was singing a divine raag called, Ahir Bhairav. I had gotten my answer, -I sing to connect to the divine, I sing to give solace to my soul, I sing not for anybody else but myself, I sing cause it brings me peace, I learn cause i am an eternal seeker, seeker of truth, knowledge of anything that is near perfect. I love to learn, it actually keeps me going. I am not learning to give music exams or pass some tests and get certificates, nor am I learning to please someone else. Its really a Divine connection, when i sing, I meet the divine. I don't know if that fits into this purposeful world, but my music is my soul.